You are reading page 2 of Low salary same work. If you want to start from the beginning Go to First Page. Ddestiny has 7 years experience as a BSN, RN and works as a ICU RN. 1. A better work environment is worth more than $1-2/hour. Toxic environments will have you burnt out or running for the hills in no time. 2. Are the staffing ratios the same? How about your # of CNAs to help? 3. Are there any on-call hours required? 4. What are the non-pay benefits? Having better insurance will more than make up for the hourly rate discrepancy. 5. Are the places similar location to you? 6. Are the shifts the same (8 5hrs, 3 12-hrs, etc; days, nights, evenings)? Same weekend requirements? 7. From which ones do you actually have an offer in hand? 8. Which places will help you with your longterm goals (return to school, preferences in specialty, family requirements, etc)? Pay is just a tiny part of the equation. nursel56 has 25+ years experience and works as a Home health, private duty. I would be taking a hard look at other factors with regard to the salary comparisons. As mentioned, an agency may offer a higher per hour wage, and correspondingly low benefits. This is done because agencies offer the upside of choosing your own schedule. I would research on job-related review sites to get a feel for what kind of culture is described there. Obviously there will be a lot of personal bias there, but you can get a general drift, usually. For me, a dollar an hour more is not worth feeling miserable and undervalued and overworked, working for unethical managers, or told to do sketchy things-- just to name a few. Best wishes to you. Aunt Slappy has 2 years experience. I second this. The salary/wage is a number on paper that gives a very tiny indication of what your whole life will be like, working for a given employer. You cannot compare a regular job to agency pay. 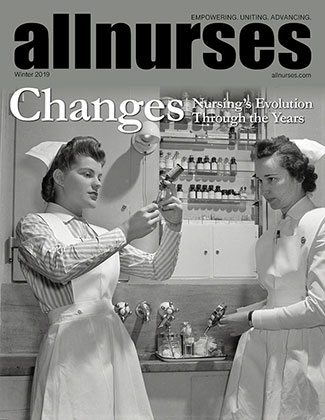 Agency nurses typically do not earn benefits; the draw is the scheduling flexibility. Also, per Joint Commission, you are not eligible to work agency unless you have relevant experience within the past year. Ruby Vee has 40 years experience as a BSN. New grad here. I just got hired at a place where the pay is lower than other places. I just don't know if I should take it if I'll be doing the same amount of work as a place where they would be paying higher. The staff seems supportive and the facility is clean. Someone I know just started working here via an agency and is getting paid more. Should I take the job or hold off on it? You cannot compare your salary to that of an agency nurse -- they get paid more, but they don't get benefits. How do the benefits at this facility compare to the benefits at other places? Maybe the salary is low but the health insurance is much better. Or you get more sick days, vacations days or holidays. Make sure you're comparing apples to apples. Look on indeed and see what the ratings from 'all' workers. That's not a bad starting pay and you'll move up fast if you are good (imo). You can't compare your pay to an agency nurse, they are of course paid by a different company than the facility they are working at plus agency almost always gets premium pay, agency nurses are also experienced so you have to factor that in as well. What you need to know is if the offer you received is in line with local wages for nurses that are at the same level of education and experience that you are at. I wanna know where you have been working? I've been nursing for 6 years.... worked in crap holes all the way to 5 star facilities to trauma center and have never received more then a 50 cent raise.... couple with a slash to the night differential or some crazy thing that pretty much evens you out to what you were making before. Hell I've even worked in places that took money out of your check for "health insurance" only to find out when you go to use it the company didn't actually have insurance for their employees! Straight up fraud! Wow! Please tell me there was a class action suit on the employer charging for insurance and not having insurance for the employees. Did you all get your money back? Where was this hell hole? So many questions! Help! Gurnick or Mission College LVN?